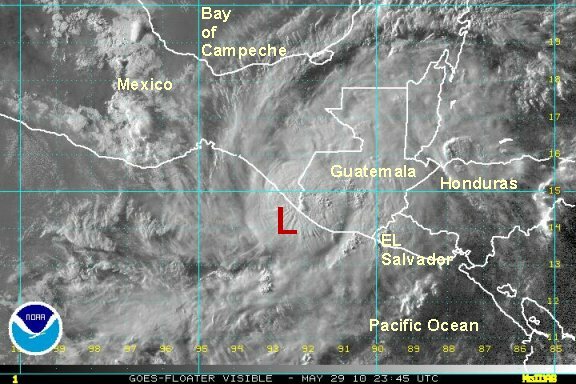 Unsettled weather has increased south of the Gulf of Tehuantepec. It appears that we are very close to seeing a tropical depression. Very heavy rainfall with the potential for mudslides can be expected from southern Mexico to Costa Rica. rainfall of 5"+ can be expected in these areas. Winds aloft are favorable for further strengthening. As of 9:00 am edt / 6:00 am pdt the tropical disturbance was centered about 275 miles south southeast of Puerto Angel, Mexico. Top sustained winds are estimated at 25 mph with higher gusts under the thunderstorms. The tropical disturbance is showing little motion at this time. Interests in southern Mexico south to Costa Rica should follow this system. 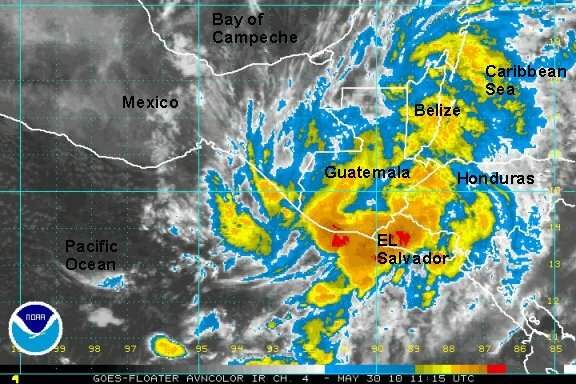 Unsettled weather has continued south of the Gulf of Tehuantepec. We are still very close to seeing a tropical depression. Very heavy rainfall with the potential for mudslides can be expected from southern Mexico to Costa Rica. Additional rainfall of 2-4" can be expected in slowly moving storms near the coast. Winds aloft are favorable for further strengthening. As of 8:00 am edt / 5:00 am pdt the tropical disturbance was centered about 225 miles south southeast of Puerto Angel, Mexico. Top sustained winds are estimated at 25 mph with higher gusts under the thunderstorms. The tropical disturbance is showing little motion at this time. After two days of trying to intensify, the disturbance finally organized last night to become a tropical depression. It will be short lived as it is already interacting with land which will destroy its circulation. There is the likelyhood that this will become tropical storm Agatha later today. Landfall will occur by Sunday morning. The main threat will be from flash flooding from heavry rainfall, especially in Guatemala and extreme southern Mexico. Additional rainfall amounts of 5-10" can be expected near the track of the low. 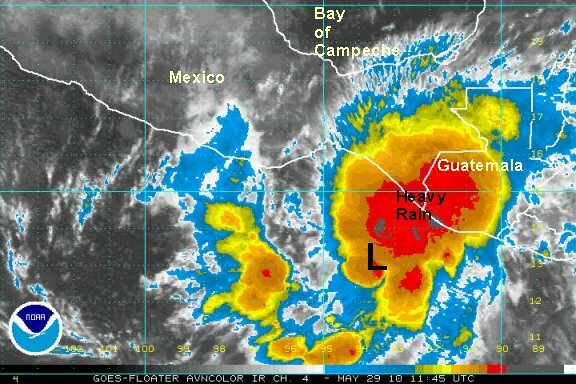 As of 8:00 am edt / 5:00 am pdt tropical depression was centered at 12.9°N 93.5°W or about 100 miles southwest of the extreme northwestern Guatemala coast. Top sustained winds are estimated at 35 mph with higher gusts under the thunderstorms. The tropical depression is moving east northeast at 5 mph. We are in agreement with NHC's assesment of windspeed, position and motion. Interests in extreme southern Mexico south to El Salvador should follow this system. The tropical depression has organized enough to be classified as a tropical storm. It will not have enough time to strengthen much more do to its proximity to land. Landfall should be tomorrow morning. The main effects will continue to be heavy rainfall associated with the tropical storm. An additional 5-10" of rain will cause serious flooding and the potential for flash flooding and mudslides. 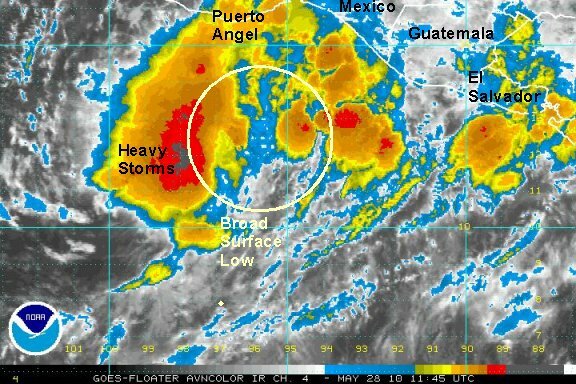 As of 2:00 pm edt / 11:00 am pdt tropical storm Agatha was centered at 13.3°N 93.1°W or about 115 miles west of the northwestern Guatemala coast. Top sustained winds are estimated at 40 mph. The tropical storm is moving northeast at 5 mph. Estimated pressure is 1003 mb. We are in agreement with NHC's assesment of position and motion. Agatha is officially a minimal tropical storm. We think winds are about 35-40 mph. Not enough of a difference to debate the 40 mph sustained. 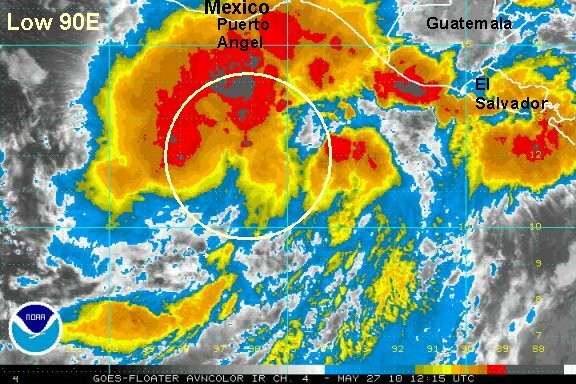 As of 5:00 pm edt / 8:00 pm pdt tropical storm Agatha was centered 50 miles west of the border of Mexico and Guatemala. Top sustained winds are estimated at 35 mph (NHC 40 mph). Agatha was moving east northeast at 10-15 mph. Estimated pressure is 1003 mb. NHC's position estimate is slightly inland. We believe that the low level circulation is still offshore and that the circulation just inland is a mid level circulation. We think that landfall will occur overnight tonight. We do not believe that sustained tropical storm winds exist any longer. The main concern remains flash flooding from heavy rainfall through the night. 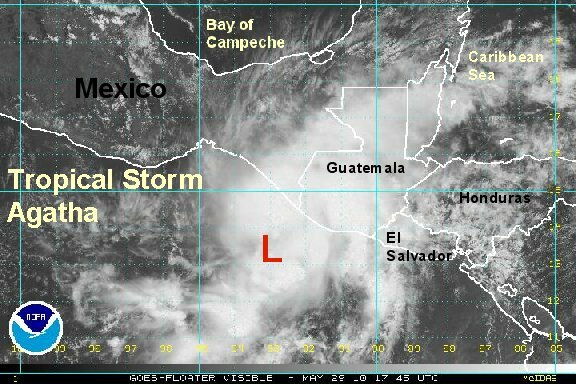 Agatha's circulation is over land and it is now a broad low over Guatemala. Heavy rainfall continues to be a concern. As of this morning the heaviest rainfall is occuring over El Salvador, Guatemala, Belize, and far western Honduras. Rain intensity will gradually weaken as the low continues to dissipate. This will be the last update on Agatha. At least 99 were killed by the flooding from Agatha. Guatamala City in the valley had reported 4.3" of rain - the most since 1949. Another town of Champerico reported 11.8" in 30 hours. Higher rainfall amounts were likely in higher terrain.